Sanskrit is the language of all mankind; it is an international language and also the language of the gods. The gods are called "girvanas"; so Sanskrit is called "Gairvani". While the emperor of Tamil poetry, Kambar, describes it as the "devabhasa", the Sanskrit poet Dandin calls it " daivi vak"(divine speech) in his Kavyadarsa: " Samskrtam nama daivi vak. " Sanskrit has no syllable that indistinct or unclear. Take the English "word". It has neither a distinct "e-kara" nor "o-kara". There are no such words in Sanskrit. Neither is the "r" in "word" pronounced distinctly nor is it silent. Sanskrit, besides, has no word that cannot be traced to its root. Whatever the word it can be broken into its syllables to elucidate its meaning. Sanskrit is sonorous and auspicious to listen to. You must not be ill disposed towards such a language, taking the narrow that it belongs to a few people. To speak Sanskrit is not to make some noises and somehow convey your message. The sounds, the phonemes, in it are, as it were, purified and the words and sentences refined by being subjected to analysis. That is why the language is called "Sanskrit"[Samskrtam]. The purpose of Siksa, and in greater measure of Vyakarana, is to accomplish such refinement. To speak the language of Sanskrit itself means to be refined, to be cultured. As the language of the gods it brings divine grace. The sounds of Sanskrit create beneficial vibrations of the nadis and strengthen the nervous system, thereby contributing to our health. 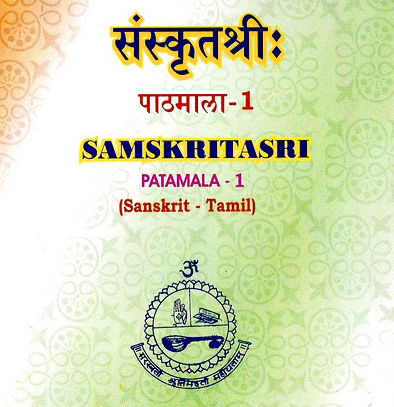 As part of an effort to propagate the Sanskrit Language to a wider audience, a Series of books have been brought out under the title of Samskritasri Patamala. These titles are now being made available online in the form of PDF files. . Click on links below to download the documents.